Western brunch is like a comfort food for us. This normally consist of eggs, bread and other protein (bacon / sausage / smoked salmon or other meat). If you can throw in excellent coffee or drinks, it is definitely an added bonus. So if there is a chance, we always in search for new brunch places. 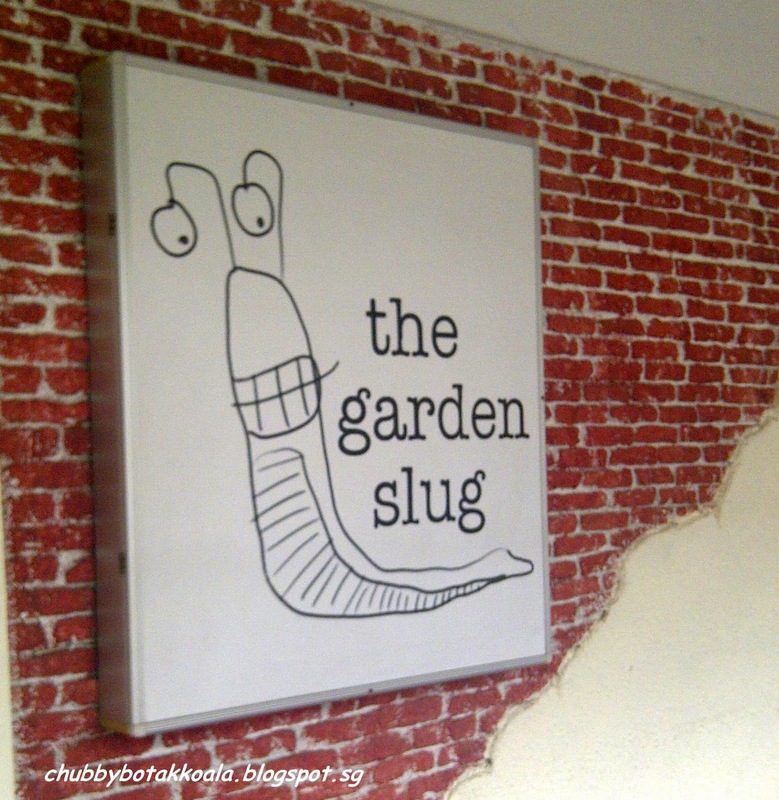 This time we end up in The Garden Slug. Who the heck come out with the name of The Garden Slug? Apparently this three entrepreneurs, Sharon, Sophie and Joseph did in 2006. I have to admit, the name is catchy and wacky and it sticks in your memory. This bistro / diners have an indoor and outdoor section. As we prefer some place nice and cooling, we chosen the indoor seating. 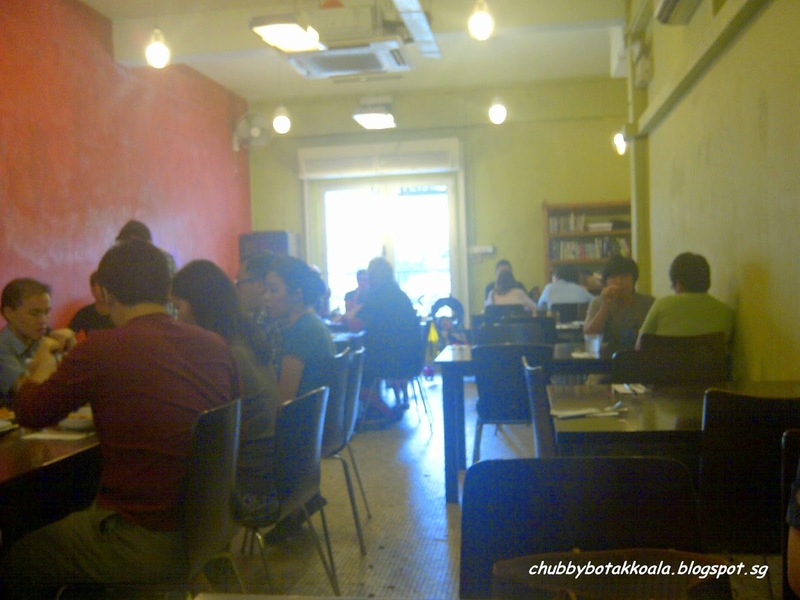 The décor of this place is simple but with red painted wall. The large glass windows, allows the natural lights to come in to the place during a sunny day. Watch out for the noise as it can get very loud when the place is packed. For starters, we have Mushroom Munchkinds ($13.90) and Calamari Rings & Lemon ($13.90). 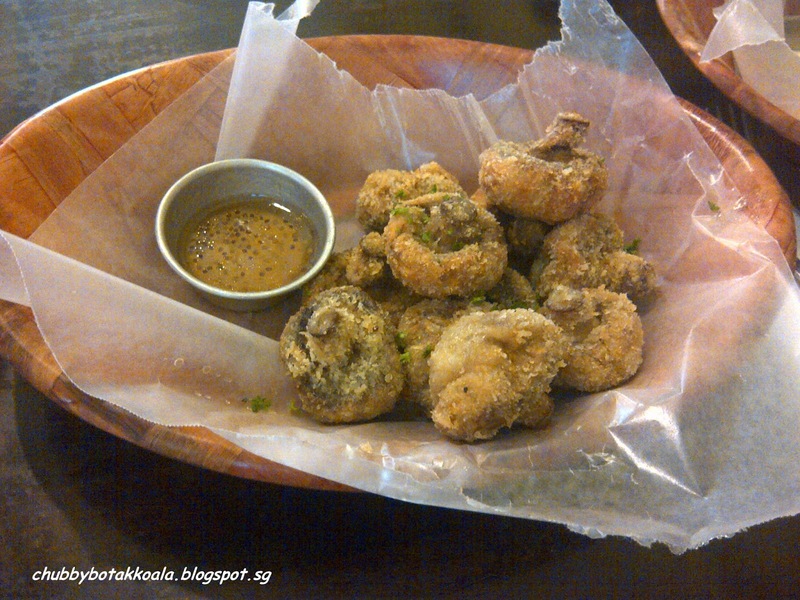 The munchkinds use button mushrooms, lightly coated with batter before being deep fried. It is crispy on the outside and juicy on the inside. The is honey vinaigrette sauce to go with the mushroom. Two thumbs up for the mushroom. 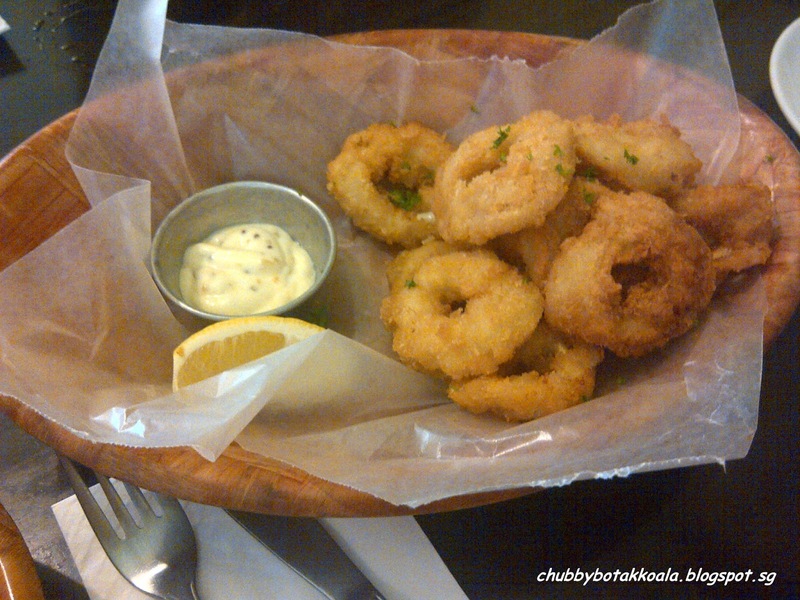 The Calamari Rings and Lemon has a thicker coating and the calamari taste a bit chewy for my liking. I find it will actually taste better if they follow the mushroom light coating. 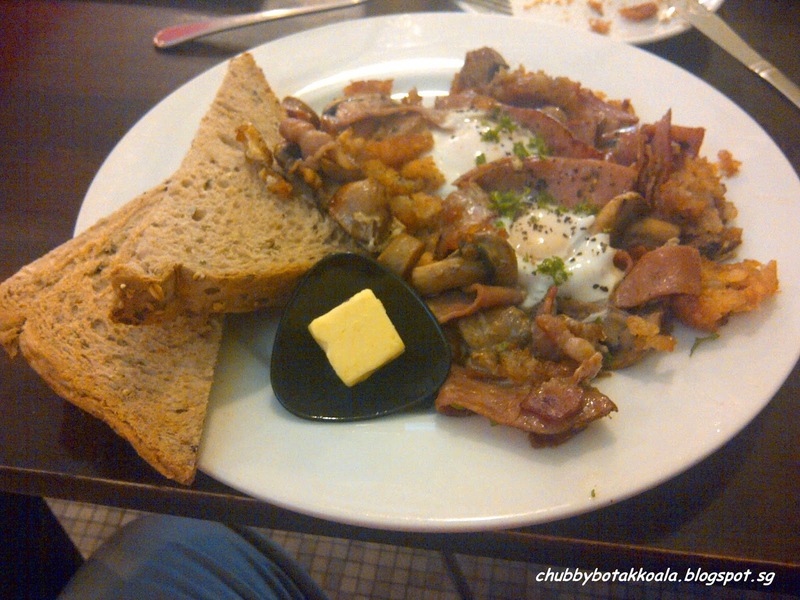 For mains, I ordered Hearty Drunken Three Little Pigs Casserole ($23.50). If you expect a stew, you are wrong. The first time I saw this similar dish, it was shown in The Naked Chef cooking show by Jamie Oliver. Using cast iron frying pan, he cooked the bacon, ham first and add eggs and tomatoes to finish the dish. The cast iron frying pan retain the heat, ensure that the meat are crispy and eggs and tomatoes cooked perfectly. The drunken three little pigs consist of whiskey scorched smoky bacon, German brats & honey ham hash with plump raisins, roast potatoes cheese eggs bake. It is slightly greasy, crispy on the bottom, but the eggs are nicely cooked. Served with two jumbo size of wholemeal bread really a meal to cure any hangover. Lets just say, I am stuffed silly until dinner. 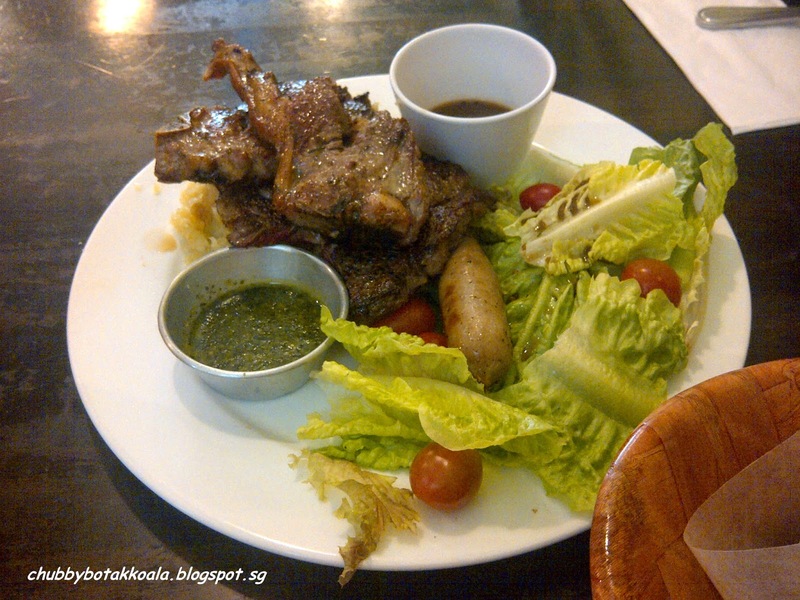 My other half and her friend ordered The Garden Slug Mixed Grill ($ 39.80) to share. This platter consist of rib eye steak strips, lamb loin, bratwurst, Real Mash and fresh garden salad. They asked for the beef to be medium rate, and lamb loin to be well done. The lamb lion is all right, juicy but a little tough, expected because we ask for well done. The beef is slightly overcook to Medium instead of medium rare. Texture wise, it is slightly chewy but juicy. For the price of the dish, we were hoping for a better grade of rib eye steak. 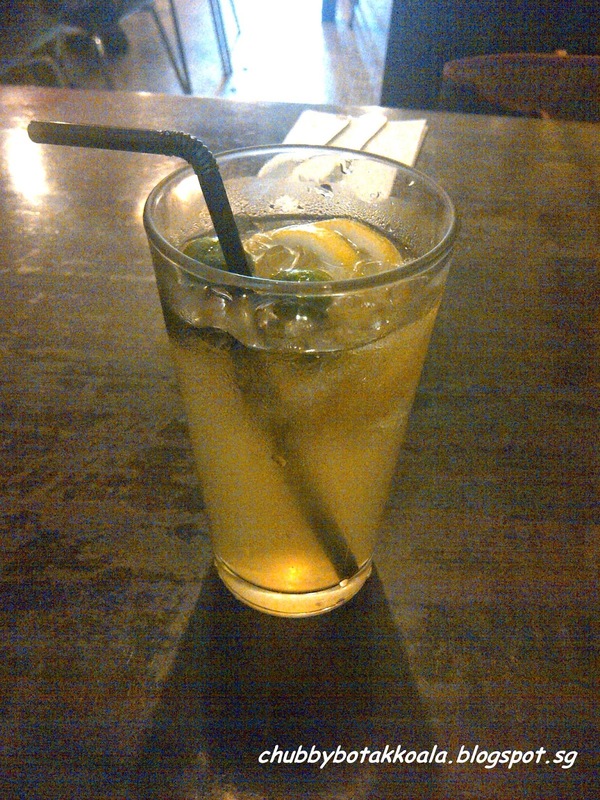 For the drinks, I have the refreshing iced honey and lemon lime ($6). Good size and nice balance of the honey with lemon and lime. Overall, it is a good place for brunch. The food price is all right, but the beverage price can be a little on the high side, watched out for the iced drinks. After all, we are at a bistro or diners not a KTV where the drinks cover the room charge. I am looking forward to explore their menu further in the future. Cheers! !